Service on the G line has resumed with delays after being suspended in both directions between Brooklyn and Queens earlier Wednesday morning. 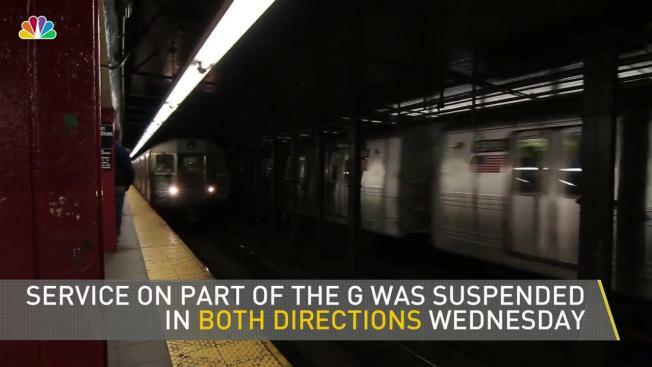 The MTA didn't specify on its website what sort of investigation at the 21st Street station caused the suspension. b/d no G trains b/t Bedford Av & Court Sq, due to an investigation at 21 St. Allow additional travel time. The NYC Transit tweeted just before 8 a.m. that after "an earlier incident" at the station, service has resumed with delays. Tens of thousands of subway riders have been stranded on jam-packed trains and overcrowded platforms in recent months as the 112-year-old system's aging infrastructure buckles under increased ridership. The situation has become so dire extensive delays and suspensions are the norm. "Good service" status on the MTA website brews skepticism. Riders report taking alternate routes involving multiple trains because they simply don't believe theirs will run as scheduled. Despite MTA vows to review "every inch" of track and overhaul the signal system, the mistrust is real -- and growing. Gov. Cuomo has warned riders to expect a "summer of hell." But for many -- from those who tried to claw their way out of a powerless F train to those who navigated dark, smoke-filled tunnels after a derailment -- the nightmare has already begun. Use #TrainPain4NY to share your stories.